Fully agree with Tim Strange and Mario Nosic, please release a new album boys!! I appreciate that living 1000s miles apart and kids can put a damper on things but I need some good music in between the insanity of my own kids. I bought this out of curiosity; I listen to it frequently because it's that good. This is great stuff ! I agree with Tim, only way to top this is Fugazi NEW album! Awesome! Some Fugazi to listen too...shame it can't finally be a new album. Its' been over a decade...please guys, lets do this! I know Joe lives in europe and others have familiy things going on, but the return of Fugazi would be so wonderful. I wonder if Fugazi will ever release any of the Albini recordings from "killtaker". Not all but some of the Albini tunes are very different and could make for an interesting 7" release. However, this 'first demo' is great from what i've heard. I really want hear Turn Off Your Guns. I cannot disagree with Sean Hoen more. This shows a fantastic evolutionary point in Fugazi's development and I for one, happen to love the recordings. I don't even think you have to necessarily be fond of demo recordings to appreciate this. They are not nearly as rough as he makes them out to be. Not everything should be pro-tooled to a high sheen. Fugazi is my favorite "rock"-based band of all time (and I am an eclectic freak), but I must say that I wish these recordings had remained unreleased. It's a curiosity, yes, but the performances are sloppy beyond charm and ultimately only convey what a huge leap they made as a recording band for the debut EP. Perhaps as a free download, but not an official release... nowhere near the quality of, say, the MT demo or Rites of Spring demo. Some thing can remained unearthed... it's okay. In regards to Norman Cchlimmer, I just checked, yes they're the same recordings. how is this the first demo recorded in 1988 if there is a demo called "inner ear demo1987" is floating around in the interwebs? are those the same recordings? Ordered LP as soon as I saw this one! It definitely made my day when I heard the news!!! This wait will feel like the longest two months of my life! Great photo on the cover. I feel like what each of them are doing, how they look, represents them quite well. Sort of surprised that is isn't Dischord #185 or #190... Can't wait to hear this official version. 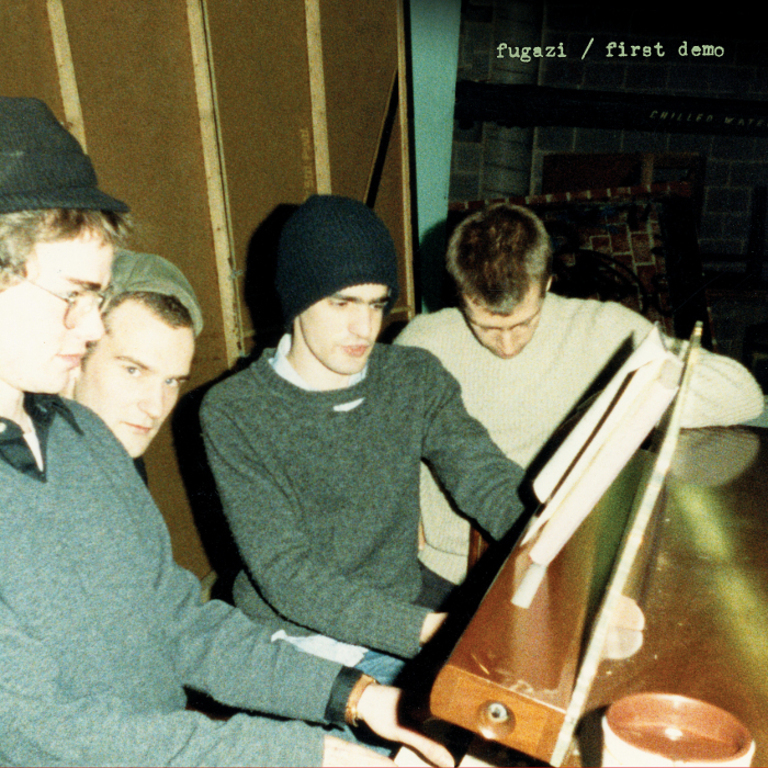 This is Fugazi's first demo, 11 songs recorded at Inner Ear Studios in 1988. LPs include a complimentary download code.